Today was a very good day. I went to a workshop of the Internet time alliance organized by Tulser. For me it was a very unique opportunity to meet all 5 members (Jay Cross, Charles Jennings, Jane Hart, Harold Jarche and Clark Quinn) of the alliance. It turned out that it was special to them too, not meeting me, but it proved to be only the second time ever, that they where all five in the same place at the same time. Each and every one of them is a great name in the field of learning, and I had the change of speaking and discussing with all of them. When I drove back my I-pod was on shuffle mode and one of the first songs was a song from Janis Joplin. I thought that was very appropriate. I like to listen to her because she surrenders herself completely to the music; she sings with great passion. The same goes for these five, they ‘eat, breath and sleep’ learning and they are a great pool of learning energy. I know I sound a bit like a groupie but meeting them was really great. 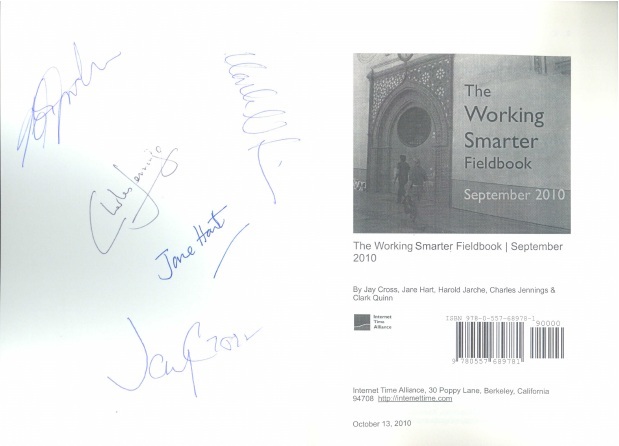 I even let them sign their (un) book ‘The working smarter fieldbook‘. Since they are hardly ever in the same place I probably am one of the few people in the world who has a copy with all their signatures. OK, that was the Internet time alliance fan page now over to the content, how was the day, what did I learn? There where about 50 people at the conference and to my surprise most of them where novices in e-learning and social learning. I expected a lot of e-Learning diehards to be attracted but there where hardly any. This meant that the discussions where sometimes very basal. Nevertheless I learned quit a lot, or maybe I should say it made me think a lot. A new one for me was the emerging practices from Harold Jarche, a dynamic version of the well known best practices. I liked the idea a lot and it fits beautifully in the EasyGenerator approach. Jane Hart said that she went from e-Learning to social business (see her blog on the subject), that’s an interesting shift of perception which makes me wonder where I am. Clark Quinn said that technology is no longer the limitation, but our imagination is. I like that a lot, so I will challenge my imagination more. Jay Cross had a great story on how corporations should publish a top 10 with their biggest failures and mistakes in order to learn from them. And he had the tweet of the day: “Knowledge workers of the world, collaborate. You have nothing to lose but your managers”. So I learned that I as a manager are the most blocking thing on the road to improvement! Charles Jennings made a great point that the goal of learning isn’t to gain knowledge or to train skills, but to change the behavior of people. As a believer in output that’s my kind of language. There was much more, but this gives you an impression of the day and what you have missed. Jos Arets (CEO Tulser) promised me that there will be more sessions like this, so hopefully……. to be continued.